Van Bibber was impressed that unlike other units, the members of Fox Company used family names rather than nicknames. He was “Van,” he writes in this pleasantly readable book. In addition to the NVA and Viet Cong, his enemies included red dust, idleness, daytime flies, and nighttime mosquitoes. Charles A.Van Bibber got that break on March 6, 1969, when he caught his Freedom Bird home. After I finished reading Cherubs-2, Marc Liebman’s book that was billed as the third in a series with Lt. Josh Haman as the main character, I looked up other books in the series, which I swiftly realized were written and published earlier than the third book. I’m not bothered by reading series novels out of the sequence they were published, especially when they were written out of chronological sequence. Big Mother 40 (Fireship Press, 402 pp., $19.95, paper; $7.50, Kindle) is another great read from Liebman—a retired Navy captain who served in the Vietnam War. This one focuses on the use of Navy helicopters in rescue operations during the war. Of course, there is also a military adventure story to go along with the education in how Navy helicopters were used in rescue missions in Vietnam. Render Harmless (Fireship, 544., pp., $21.95, paper; $6.50, Kindle) finds Lt. Haman on an exchange with Fleet Air Arm in 1976 when the Red Hand starts setting off car bombs. There is lots of detail on car bombs, but not enough detail that I felt able to build and safely detonate one when I finished this exciting thriller. Those who enjoyed any one of Marc Liebman’s novels featuring Josh Haman are more than likely to enjoy all of the rest of them as well. 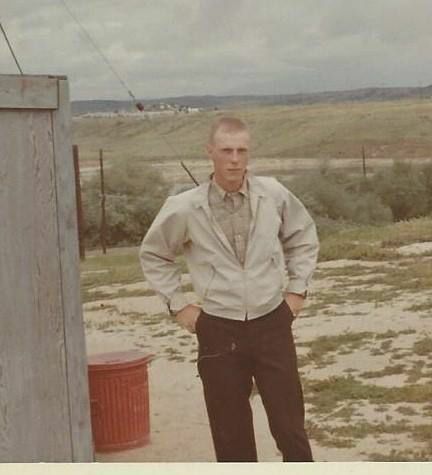 Marine PFC Anthony “Tony” Pepper disappeared in 1968 while attempting to capture Hill 700 in Vietnam, west of Khe Sanh. Four days later his parents received a telegram that listed him missing in action. The message was the first of six similar telegrams the Pentagon sent to the family in the next six months. A seventh and final message classified Tony as killed in action/body not recovered. The loss of their only son put the Pepper family members into mourning for the remainder of their lives. Following the deaths of both parents and the estrangement of an older sister, Tony Pepper’s younger sister Carrie took up the challenge of finding his remains. She had been thirteen when Tony died. Carrie Pepper tells the story of her quest in Missing on Hill 700: How Losing a Brother in Vietnam Created a Family in America (Cottage Ink, 242 pp., $24.95). Vietnam veterans of 2nd Battalion, 26th Marines who had fought alongside Tony Pepper comprised the new family that she created in America—a family dedicated to the remembrance of her brother. She found these veterans, many with closely involved wives, and built relationships with them through phone calls, email, letters, visits, memorial services, and unit reunions. Carrie Pepper’s research has recreated the last days of her brother’s life. At the same time, she vicariously experienced what he would have gone through had he survived the war because her band of new brothers also shared the good and bad from their post-war lives. Despite never finding her brother’s remains, Carrie Pepper arranged to have a ceremony to place a tombstone for him in a special section of Arlington National Cemetery in 2007. Strong similarities link Carrie Pepper’s Missing on Hill 700 with June 17, 1967 by David Hearne. The books differ only because a civilian woman wrote one and a former artillery lieutenant wrote the other. Both stories, however, focus on small infantry units that needlessly suffered high casualty rates. A tragic undercurrent of the stories is that the casualties were young men who willingly followed flawed tactics and indifferent orders. These accounts recognize a problem common to small unit operations in the Vietnam War. The lessons taught by them deserve to be told again and again. Each one was an avoidable tragedy. The novelist Philip Caputo served as a Marine lieutenant in the Vietnam and is best known for his classic memoir, A Rumor of War, which was published in 1977 and has remained in print since then. He’s written another Vietnam War novel, Indian Country, his latest book, Some Rise by Sin (Henry Holt, 352 pp., $28, hardcover; $14.99, Kindle) is set in the Mexican village of San Patricio beset by a war between a brutal drug cartel and the Mexican Army and the police. It is often hard to tell who is who. Padre Timothy Riordan is an American missionary priest who has been sent to Mexico more as a punishment than anything else. He buddies up with Lisette Moreno, an American doctor who ministers to the villagers’ health rather than their souls. Her lesbian love affair with artist Pamela Childress adds drama to her life in the village. From the first page of this novel, the main characters seem headed for a cliff they must inevitably tumble over. It’s no surprise when a real cliff appears in the narrative. Padre Tim is the most tortured soul I’ve encountered in modern lit in a long, long time. Padre Tim is learning in Mexico that who he’d thought he was had been a lie fabricated out of pride. His struggle to figure out how and why an all-loving God allowed—and seemed to encourage—the existence of evil was fated to fail, and to bring down his work as a missionary. There were no more references to the Vietnam War after that, other than a brief mention that the helicopters and piles of weapons in Vietnam continued to be used by police, soldiers, and drug traffickers. The rest of the novel is held together by the suffering of Padre Tim. Caputo portrays Tim’s suffering every bit as well as Graham Greene would have done were Tim a whiskey priest. Caputo tells a powerful story in this novel, so powerful that I believed every word of it and figured that he based this narrative on actual events in Mexico. I highly recommend this new novel by this master story teller who has honed his gift for many decades and is totally on his game in this book. Despite their apparent superiority, the Americans walked to LZ X-Ray and found themselves ambushed, surrounded, and overrun by the NVA 271st Regiment. A stream of Army helicopter gunships, forty-three Air Force fighter sorties, and 8,250 artillery rounds made the difference in turning back two NVA assaults—a massive display of firepower considering that the battle lasted only one afternoon. 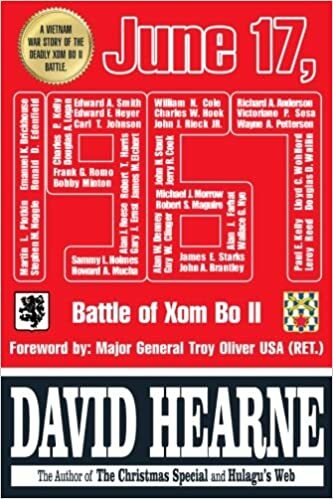 Hearne examines the engagement from multiple perspectives in June 17, 1967: Battle of Xom Bo II (Subterfuge, 386 pp. ; $17.95, paper; $3.99, Kindle), including recollections of fellow soldiers. Amid descriptions of the action, he offers biographies of the men linking them to their families and friends back home. He also intersperses chapters that compare young soldiers to their counterparts in the civilian world. Even after half a century of reflection, the broad dichotomy of their values still disturbs him. Overall, Hearne presents a grim picture of the destructiveness of weapons of war. He discusses the effects and duties encountered as part of the aftermath of battle: wounds, shock, feelings of guilt and loss, and fulfilling graves registration requirements. Sixteen pages of photographs and maps support Hearne’s account of the battle. He also includes the official After Action Report. Books about Xom Bo II are rare. Gregory Murry presented a sergeant’s view of the encounter In Content with My Wages (2015). Hearne recognizes him for providing a “plethora of facts.” Because they fought in different positions on the landing zone, their views differ. Primarily, Murry found significant faults with the American master plan and tactical decisions. Both books are well worth reading: They show how a quiet day in a war zone can instantly turn into a gruesome nightmare. The latest book in Osprey Publishing’s long-running “Elite” series of richly illustrated, concise compendiums of military forces, artifacts, people, and warfare techniques is Vietnam War U.S. & Allied Combat Equipments (65 pp. $19, paper), written by the much-published Gordon L. Rottman, who served with Army Special Forces in the Vietnam War, and illustrated by the veteran artist, Adam Hook. This volume does a fine job focusing on showing and telling the things we American soldiers and Marines carried in Vietnam, along with sections on the combat equipment used by the ARVN, and the Australians. We’re talking about equipment here, not weapons so much—so, we get detailed explanations (and photos and sketches) of all manner of things such as weapon accessory cases, rucksacks, canteens, entrenching tools, machetes, bayonets, flashlights, gas masks, and much, much more. Long Daze at Long Binh by Steve Donovan and Fred Borchardt. Long Daze at Long Binh: 24th Evac Hospital South Vietnam, 1966-68—The Humorous Adventures of Two Wisconsin Draftees Trained as Combat Medics and Sent Off to Set Up a Field Hospital in South Vietnam, (DCI Communications, 380 pp., $24.95, paper; $5.99, Kindle) is a humorous memoir by Steve Donovan and Fred Borchardt. There are 37 chapters followed by a detailed glossary. I recommend checking out the chapter headings before reading the book. You’ll find “Robert Mitchum needs to learn to salute,” “Chuck Connors owes me a tooth,” “Praying for rain and Raquel Welch,” and so on. We are told the book consists of the authors’ best recollections of things that happened fifty years ago. They admit to tweaking the narrative to make the book more interesting and exciting. These two young men from Wisconsin were stationed at Long Binh the same time I was there. I was eager to compare notes with Donovan and Borchardt. Full disclosure: I know Steve Donovan from our post-war careers. Donovan and Borchardt served for sixteen months with the 24th Evac. They managed to perform the duties of more than sixteen different military occupational specialties—from hospital orderly to prisoner guard to headquarters clerk. There is nothing about combat in this book. As I always do, I kept a running list of pop culture names that popped up in the narrative. I won’t weigh down this review with the complete list. Suffice it to say the list includes Arlo Guthrie, Jane and Henry Fonda, Bob Hope, James Brown, and Robert Mitchum. Agent Orange gets good brief coverage. The unique structure of Long Daze—alternating the two points of view of the authors inside the chapters—gives the reader great contrast and comparison and is the main strength of this accessible and useful book. Yes, it is funny, but it is much more than that. It is a repository of facts and memories from this long-ago time. There are no clinkers or clunkers in this book. The authors get it right and they make it all interesting. Thanks, guys, for producing the best book about REMF life in South Vietnam during this time period. Nobody will top you any time soon, if ever.